Social policy primarily refers to guidelines and interventions for promoting human welfare. 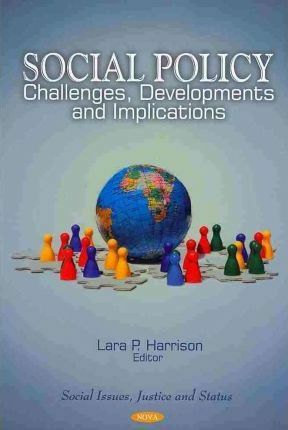 This book links the findings from developmental psychopathology to social policy and to the importance of creating policies to prevent the development of psychopathological problems. This book also investigates the relationship between social policy and human development in the specific contest of West Sub-Saharan Africa, highlighting the important modernising, democratising and consolidating function of welfare institutions. Moreover, minimum wages have been rationalised an anti-poverty device, domestically and internationally. The authors argue that minimum wages are at best an exceedingly blunt instrument for curbing poverty, at worst may exacerbate poverty in the long-run. Furthermore, given the prevalence of mental health and/or substance use issues, supported accommodation services and residential rehabilitation services have an important role in facilitating recovery among people who experience these issues. The authors argue that supported accommodation and residential rehabilitation services share a number of similarities. A discussion on the importance of clear government policy to guide the two services types is also included, as this has the potential to enhance service provision and, ultimately, client well-being. Other chapters describe the historical development of welfare policy in Denmark, analyse the social representations of domestic violence inflicted against low income women, and provide a game-theoretic model to discuss the role of the media in earthquake prediction. Preface; Permanent Emergency Welfare Regimes & Human Development in West Sub-Saharan Africa; Welfare History of Denmark; The Poverty of Minimum Wages as an Anti-Poverty Policy; Developmental Psychopathology: Social Policy & Interventions; Practice-Related Issues & Policy Implications of Domestic Violence in Brazil Domestic Violence: The Brazilian Scenario; What is Supported Accommodation? A Comparison of Supported Accommodation & Residential Rehabilitation Policy Frameworks; The Role of Media in Earthquake Prediction; Risk, Government & Social Policy; Poverty, Urbanity & Social Policy in Central & Eastern Europe; Index.